These are photographs of second-hand books being sold on the pavements of Mumbai. 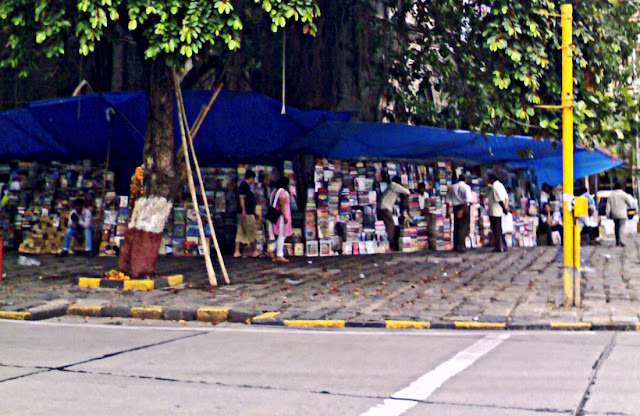 These pavement book stalls are visible on the streets of most cities of India and books are sold as cheap as a ten rupees in some cases. Bigger cities command higher prices. Many of these stalls are illegal stalls occupying the sidewalks but most of them get away with it with connivance of officials. 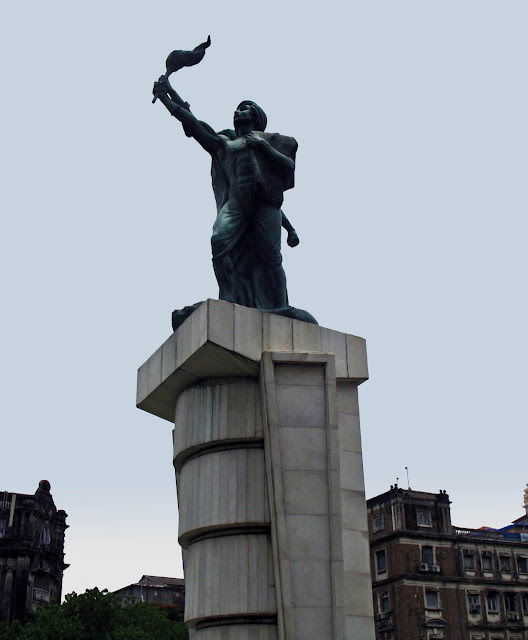 This photograph is taken in South Mumbai, opposite Churchgate station. The photograph is also taken in South Mumbai, near Fountain. 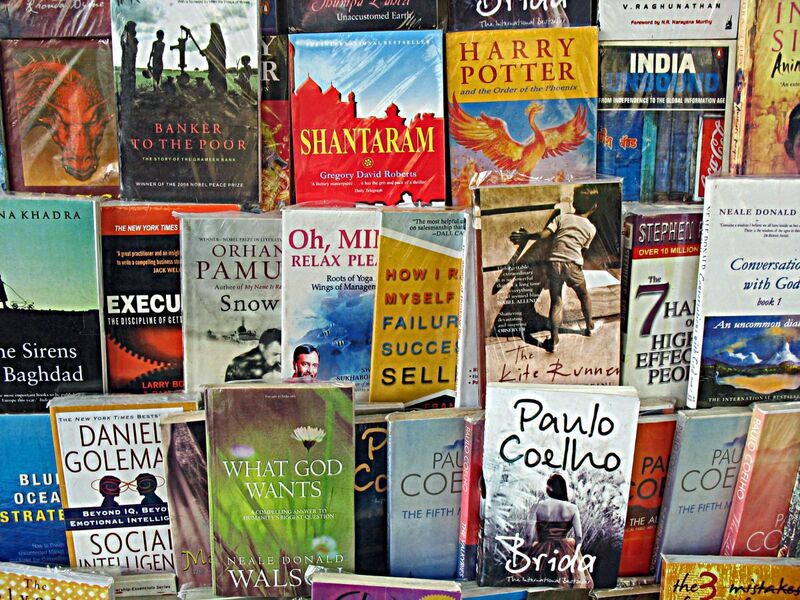 However these particular book hawkers and their stalls are not there now. Probably evicted. 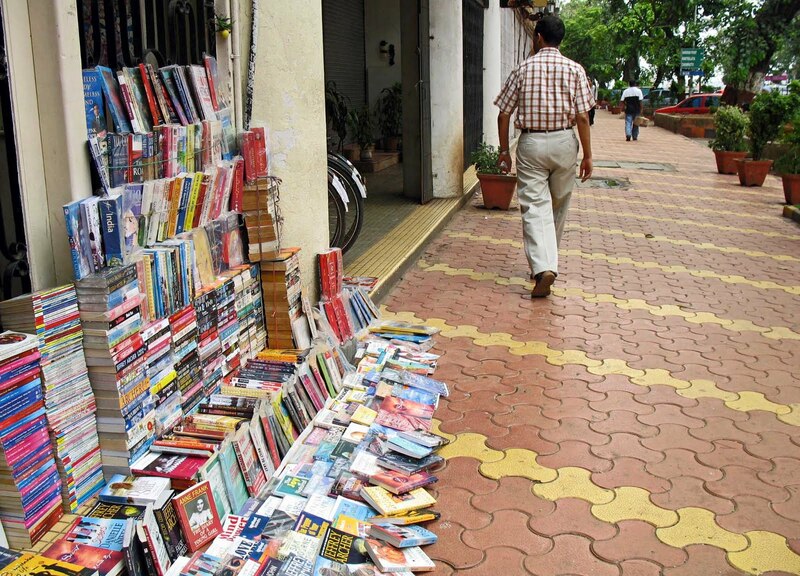 Here is a close-up of books which are stacked neatly on the pavement. 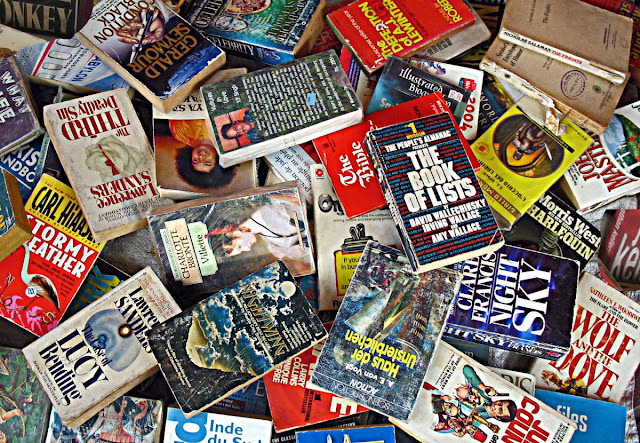 Popular titles are what make business lucrative for the book sellers. Some of these books are brand new pirated versions of the originals. Shantaram is a popular book and a pirated edition can be bought easily. Paul Coelho is also quite popular. 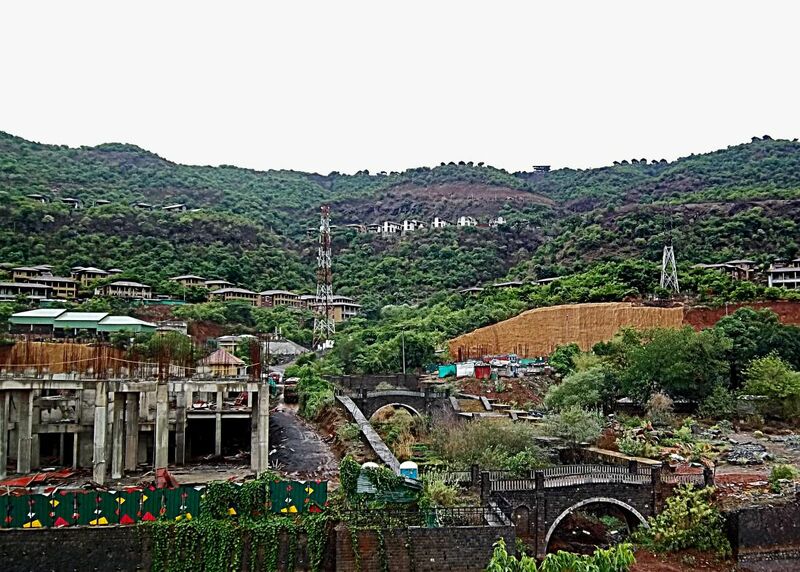 A city project under development called Lavasa has been in the eye of controversy and has come under the scanner for dubious land deals and environmental damage, all involving politicians. The objective is to develop a pretty city both as a getaway for tourists and also a place where people can live in beautiful surroundings. 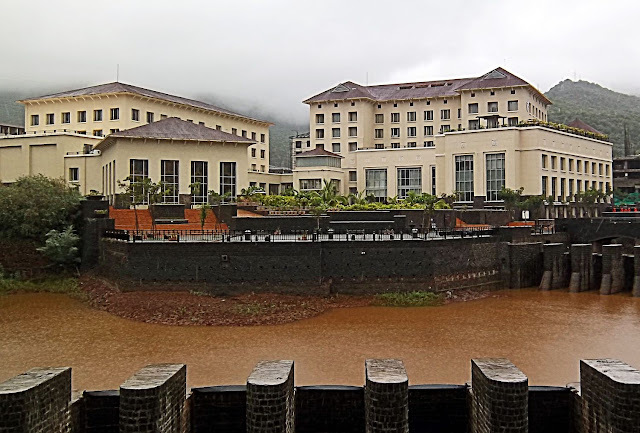 This project has temporarily been suspended although people do go there as hotels are operational. More about the corruption here. This is an overview of the main promenade and hotels. When we visited the river bed was dry. 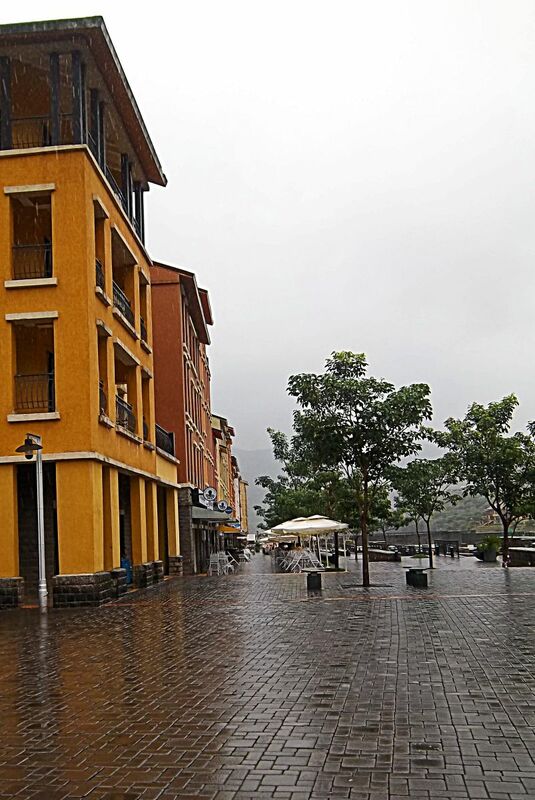 You can see white sun umbrellas on the wide Lavasa promenade where people relax and enjoy the view. On one side are the hotels and on the other side is the river bed. People pass the time walking up and down the promenade. 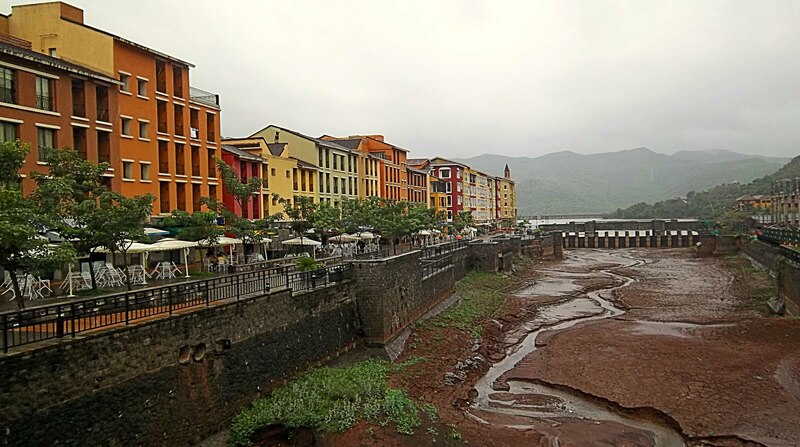 A young hip crowd mostly although I am not sure why they like Lavasa. There is nothing here. Certainly not nature. It's nature ruined. This is a facade of one of the hotels. All kinds of restaurants are active here and some of them are very fancy ones. 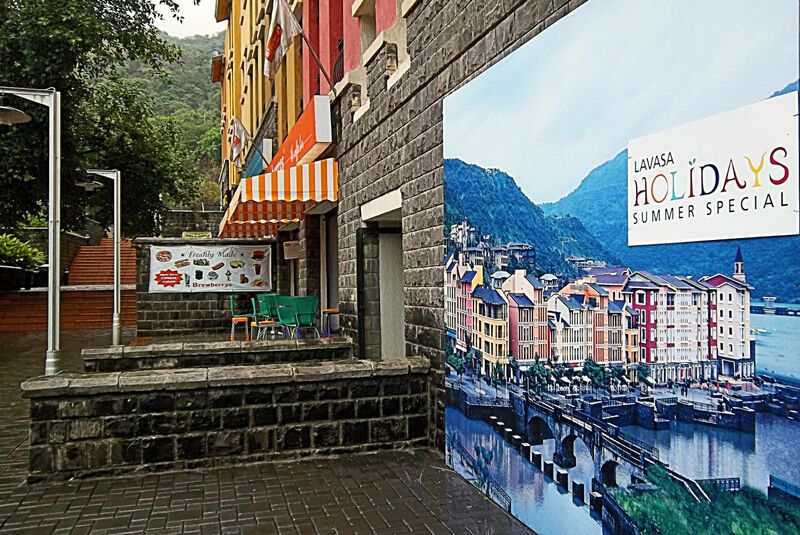 Another view of the buildings of Lavasa. The promenade (seen in the next two photos) is broad and nice to walk on. For some odd reason the architecture has been copied from some western cities. Most buildings are tall and narrow structures with little or no ventilation. The rooms are claustrophobic with the narrow windows and almost non-existent balconies. Great for cold weather, but not comfortable for the hot Indian weather. 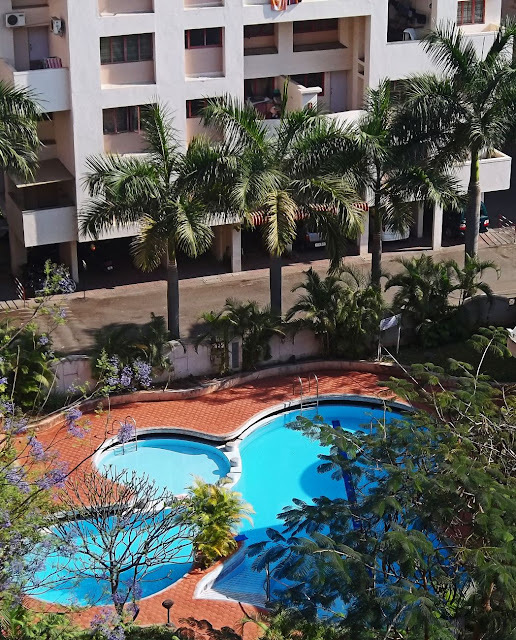 Some folks might not have a choice when it comes to buying a tiny flat with poor ventilation as a home in a crowded city, but why would they go to a hotel over the week-end where the rooms do not let in air? Specially as the idea of coming to Lavasa is for enjoying nature? I could not help but laugh when I saw the names of the streets! Are people really impressed with these fake names? This is a view of another hotel at Lavasa. They say it's better that the ones at the Promenade but we never went there. Now the ugly side of Lavasa. The breaking down of the hills and ruining of the environment is in full swing. 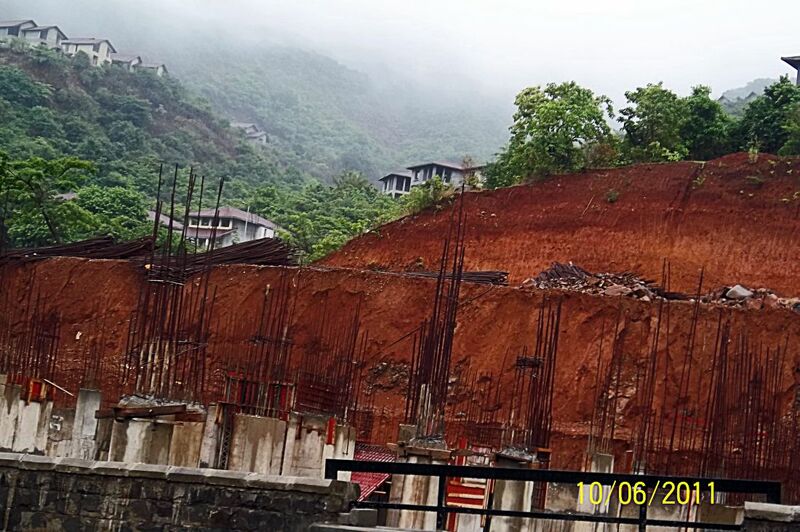 However environmentalists have halted the construction activity. Today a lot of Lavasa looks like this. Half complete. The houses on the hillside are incomplete shells. There is no one living there. This is a sad sight. Actually digging into the hill to make space for a building. I am not an environmentalist but even to my layman's eyes it didn't seem right. 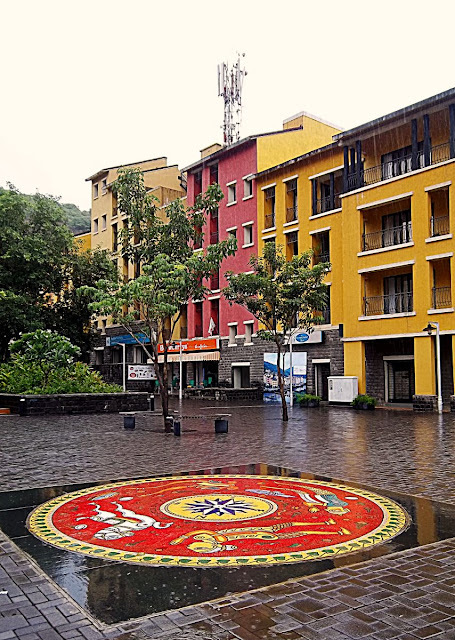 During this important religious festival of India, special type of yellow flowers are used to decorate homes, places of worship, for poojas and vehicles. This festival is to celebrate the victory of Lord Rama over Ravana. Symbolically it is a triumph of Good over Evil. Flowers are very important in Hindusim. They are used extensively in rituals and pujas. Yellow and orange flowers are preferred. Marigold is commonly used to weave into garlands. 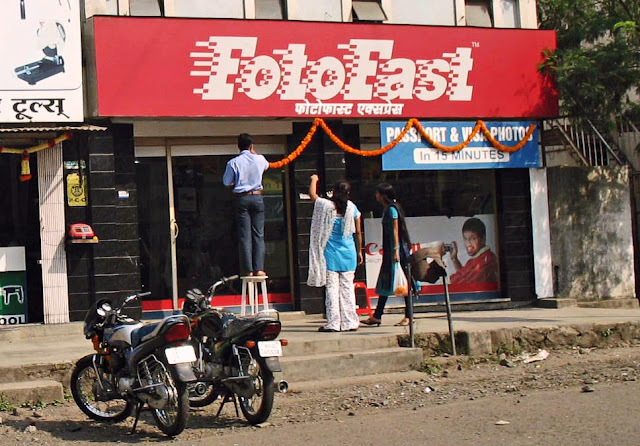 These photographs show how flower garlands are used to celebrate this festival. 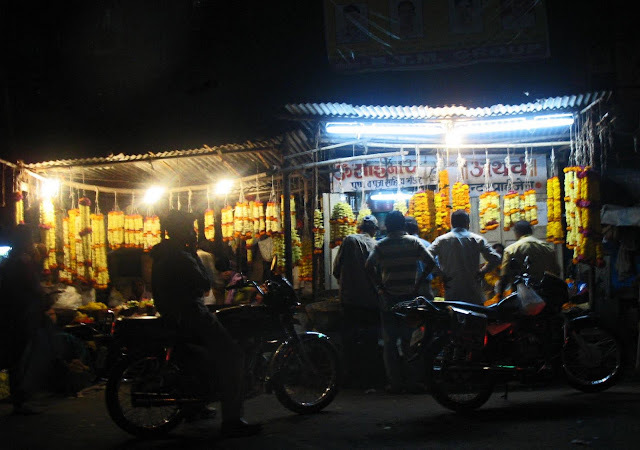 Here people have gathered the evening before to pick up some marigold garlands for use. 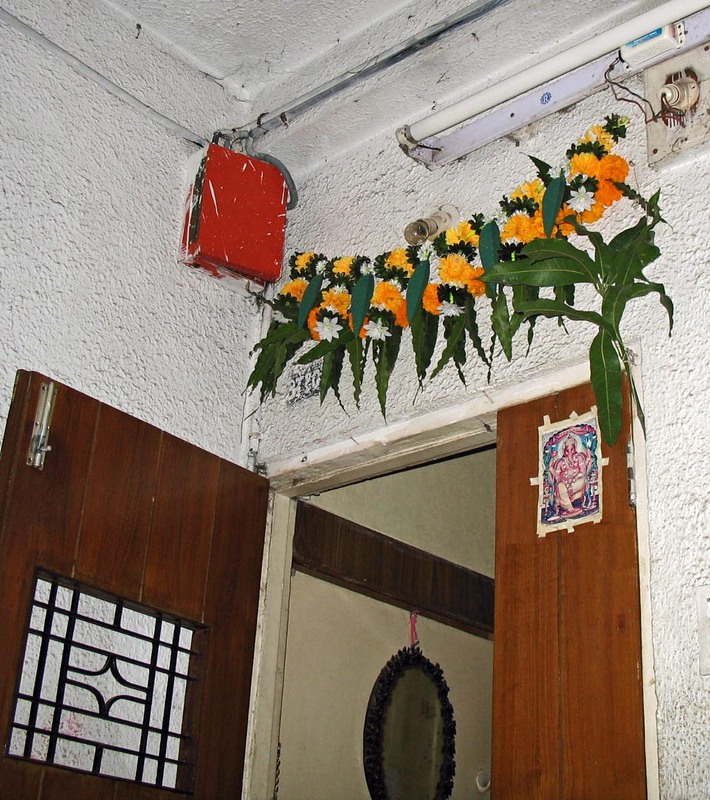 It is standard practice for all Hindus to decorate the entrances of their homes with the dasara flowers. Vehicles and tools of the trade are given a lot of importance. 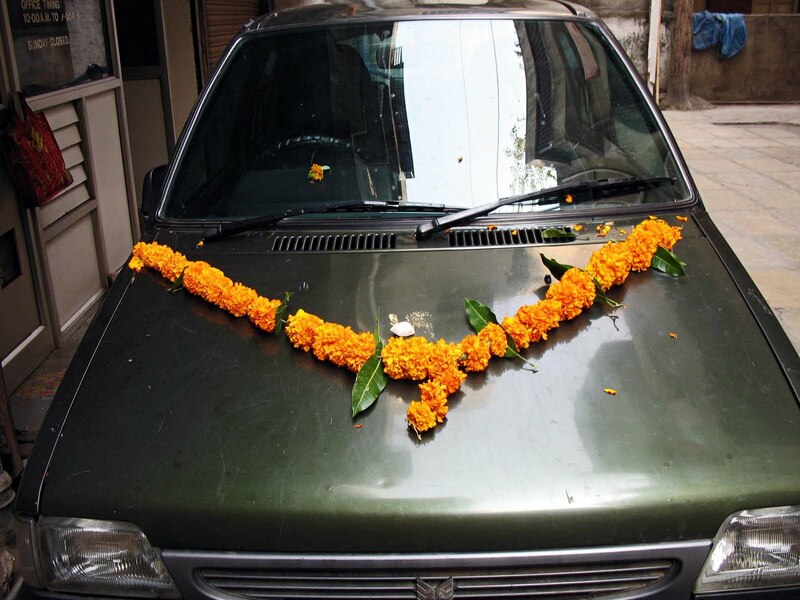 A picture of a car with a marigold garland. 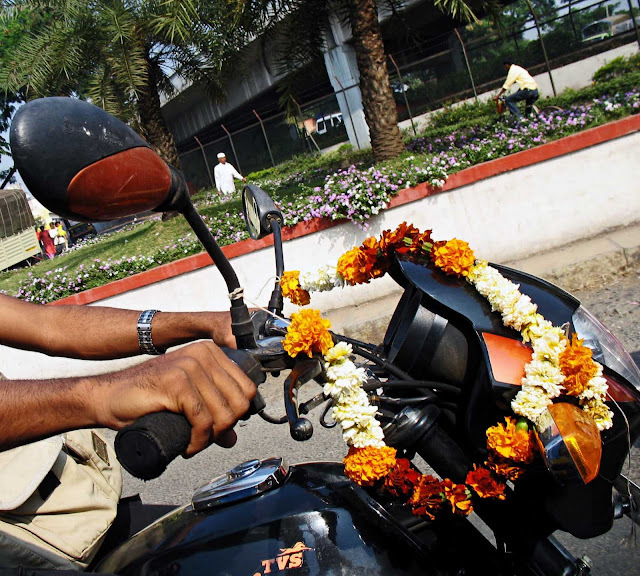 A two-wheeler with a marigold garland. Here is a shopkeeper opening his shop after decorating it with garlands of orange flowers. Fake flowers are often used. Doorways and entrances are decorated with synthetic garlands, and these are often kept on the doorways long after the festival is over. Another example of what is called a "toran." 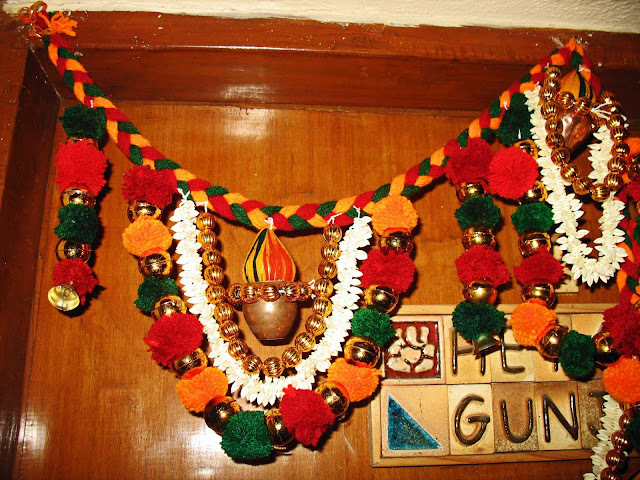 This is a decorated garland, often synthetic, which is often used these days. 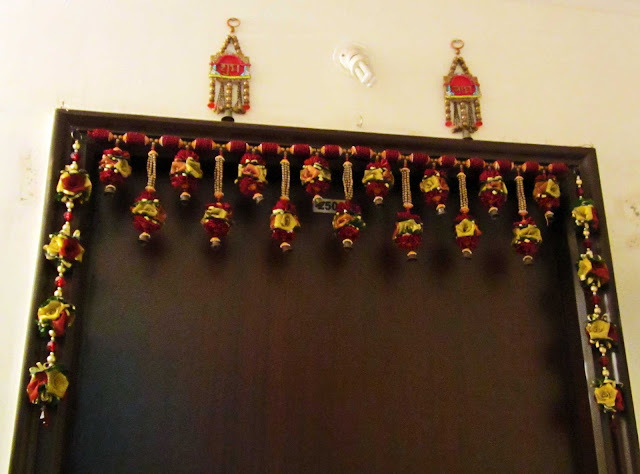 One can keep it on the doorway indefinitely unlike flower garlands which have to be removed. 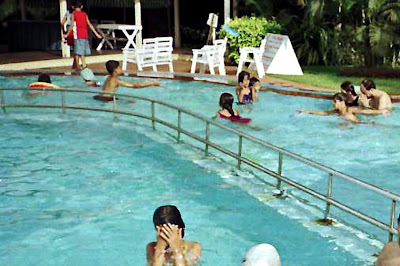 These are swimming pools used for recreation. Most of them are shallow pools meant for leisure. 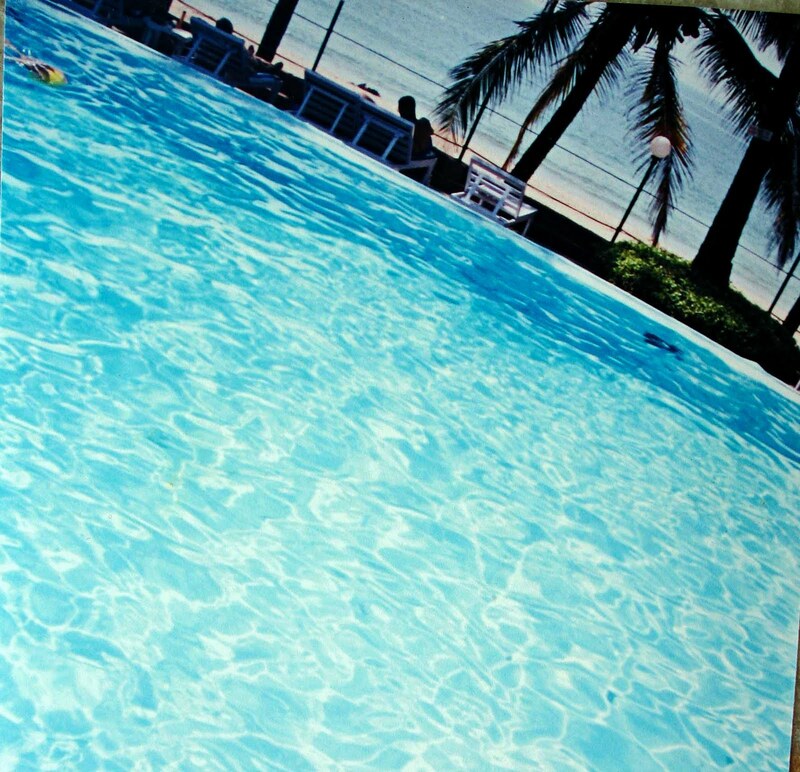 This pool is attached to a holiday resort. There are people swimming. This is the same pool from another angle. The holiday resort is visible in the background and the still waters of the pool in the foreground. The steel ladder used to climb down into the pool is in the foreground of the picture. This is a small pool shaped like petals of a flower. 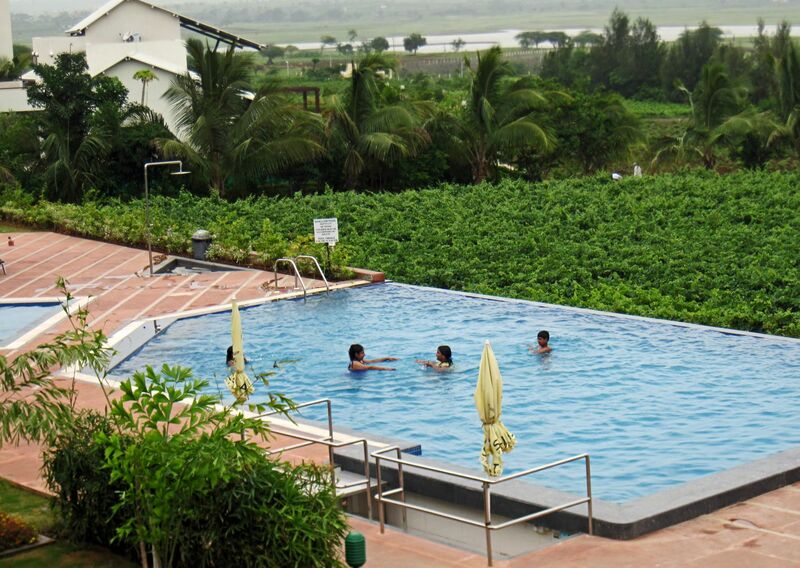 This pool is attached to a housing colony. A pool attached to a hotel with people and children swimming in it. 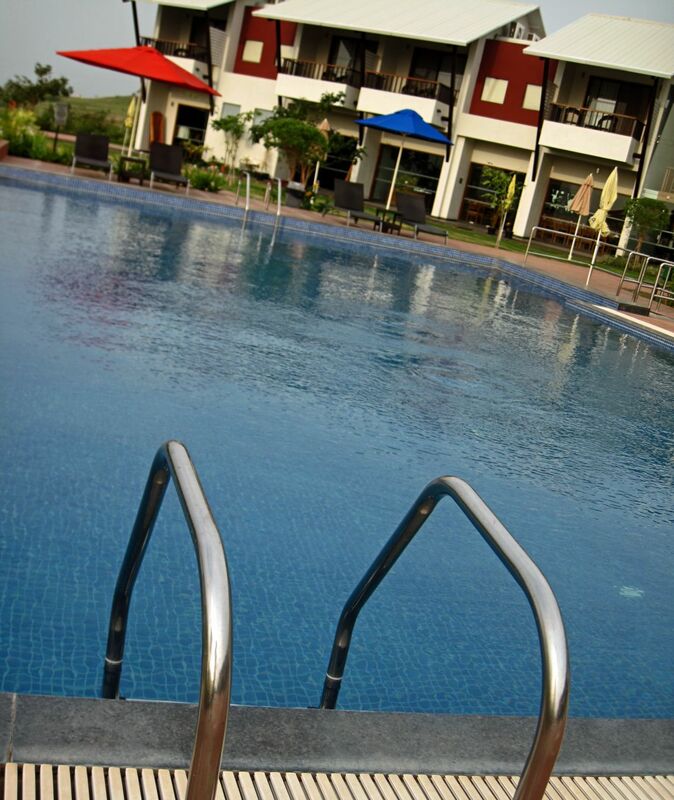 A beautiful deep pool in a popular hotel in Goa. The beach is in the background. These are pictures of costume jewellery available in jewellery markets in India. 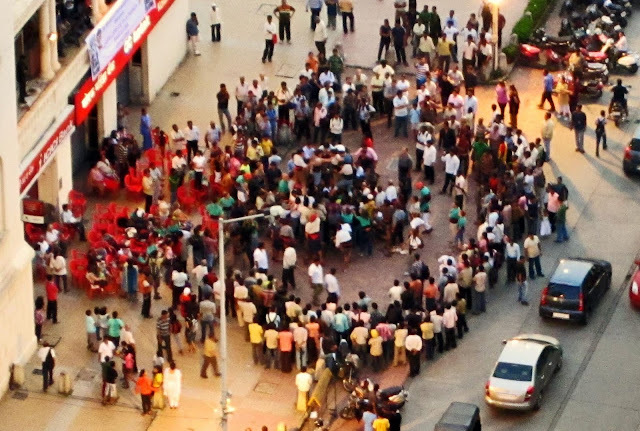 These particular shots were taken at Colaba Causeway, a shopping centre frequented by tourists. 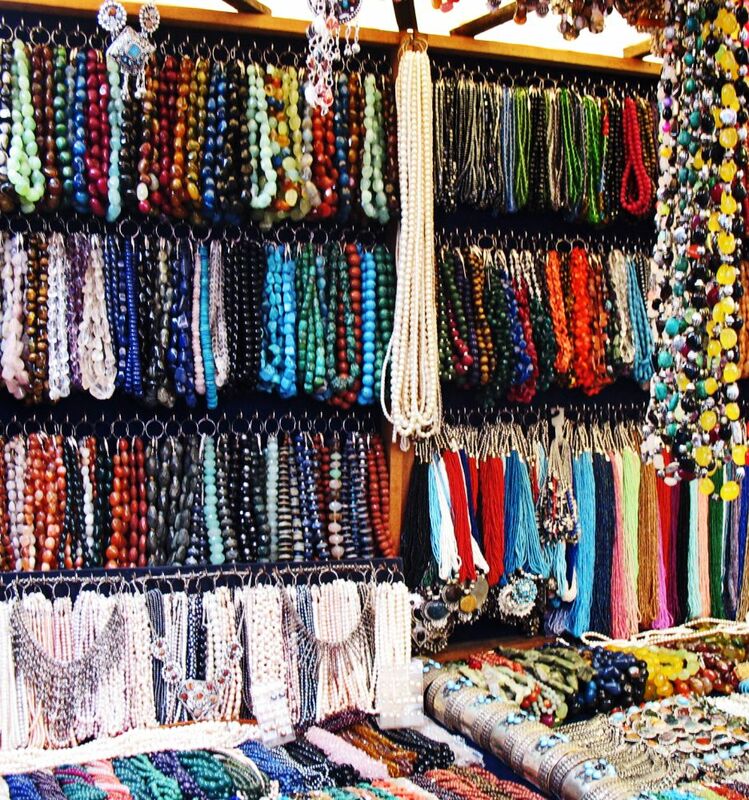 People bargain hard for the trinkets found here. Fake jewellery is popular amongst the young and the feisty. These necklaces are colourful, pretty and you can find fashion jewelery matching for every dress you choose. 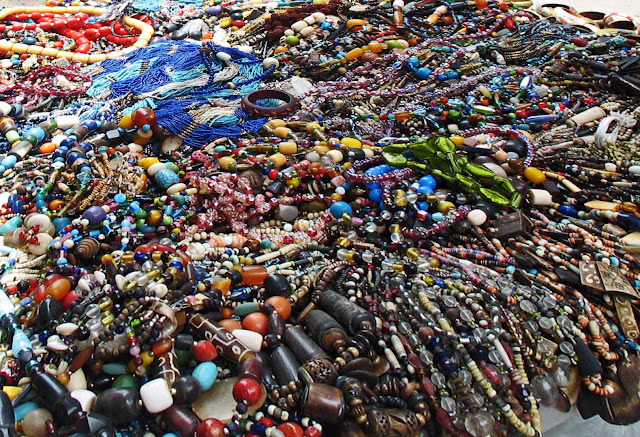 Inexpensive materials like glass, plastic, synthetic stones as well as cheap metals are used to make this type of jewelry. 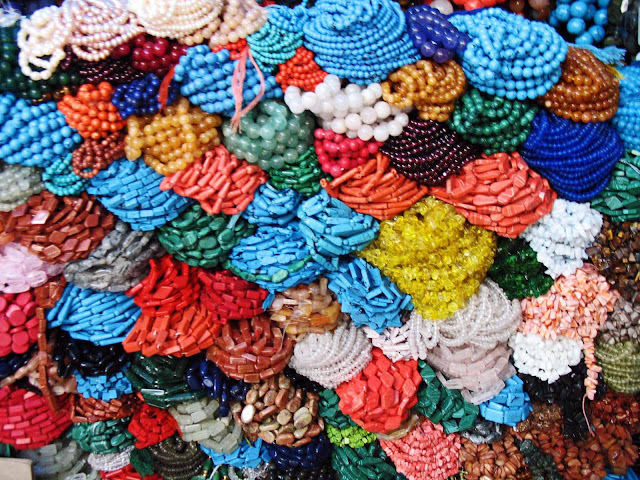 These chunky necklaces made of beads of different colors and sizes are more of a fashion statement than anything else. This type of jewelry is considered disposable. It's cheap and easy to mix and match with different occasions. As can be seen some amount of effort has been put into designing this jewelry. 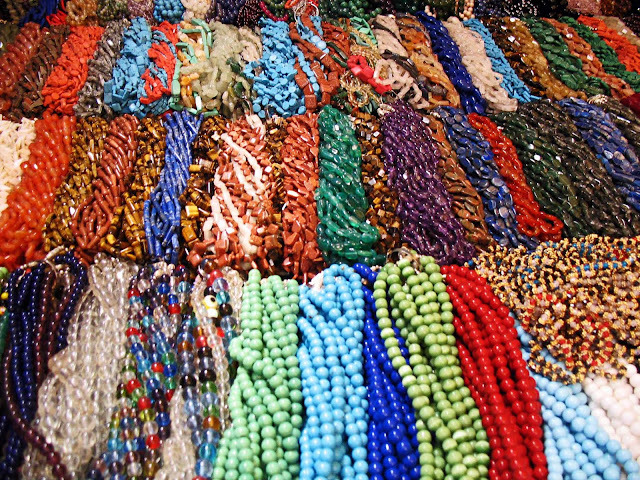 These are colourful necklaces displayed in a jewelry shop. 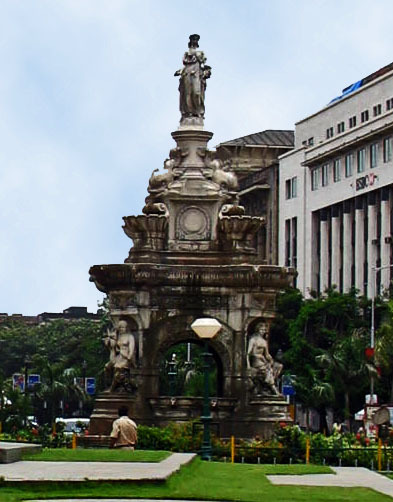 Flora Fountain, at the Hutatma Chowk (Martyr's Square), is a heritage monument in South Mumbai in the Fort business district. It was built in 1864, during the British era. 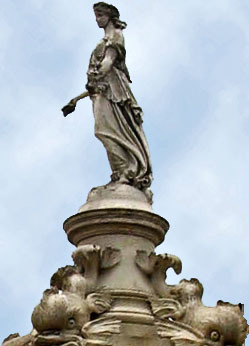 The fountain depicts the Roman goddess Flora, the goddess of flowers and spring. 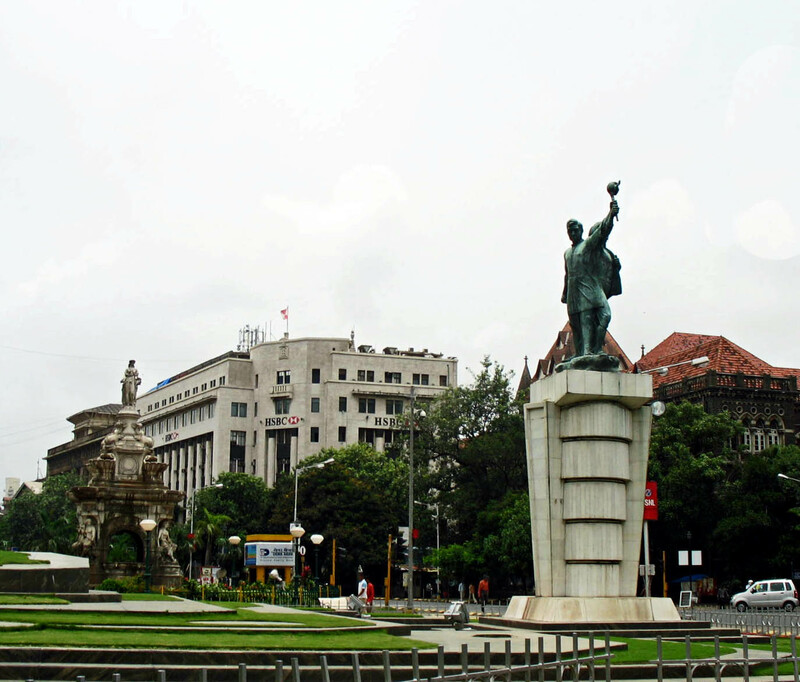 This is easily the most famous square in Mumbai, a point where five streets meet.Another statue (patriots holding torch) was added to the square in 1960, in memory of those who died in the struggle for the Maharashtra state. In this photograph you can see the fountain with goddess Flora in the background and the torch-bearing patriots in the foreground. Some buildings around this square are also considered heritage buildings, like the on the extreme right of the image. A closer look at Flora Fountain. A close-up of the patriots holding up the torch of freedom. 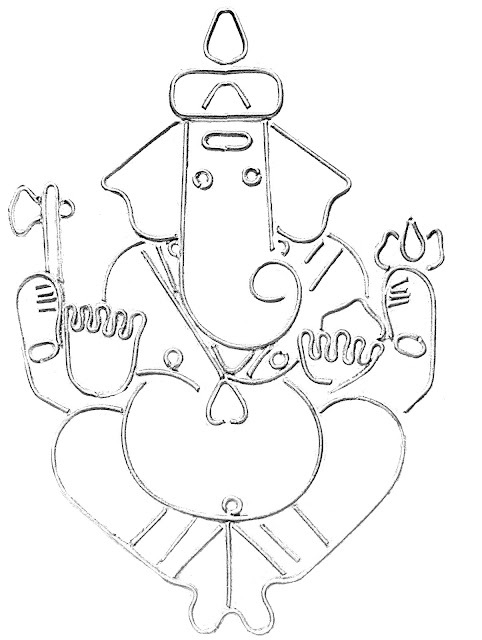 These are sketches and illustrations of the deity Lord Ganesha, a very widely worshipped diety amongst Hindus. 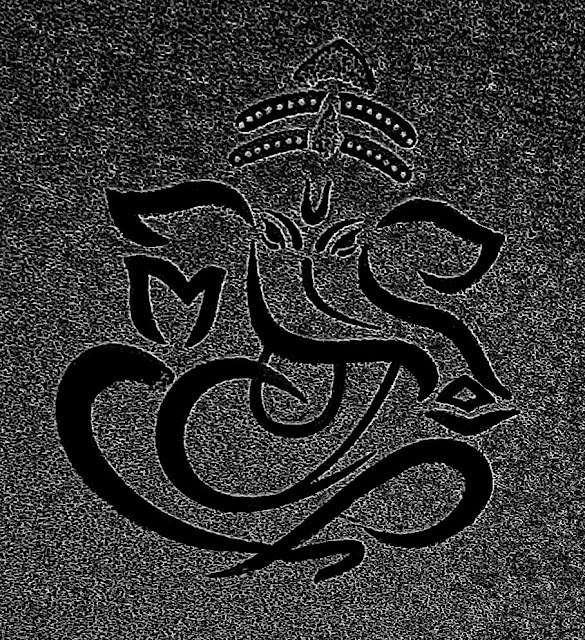 He is known for being the remover of obstacles, the God of Plenty or the God of Success. Ganesha is the of Lord Shiva and Goddess Parvati, and is represented by an elephantine head and a human body. 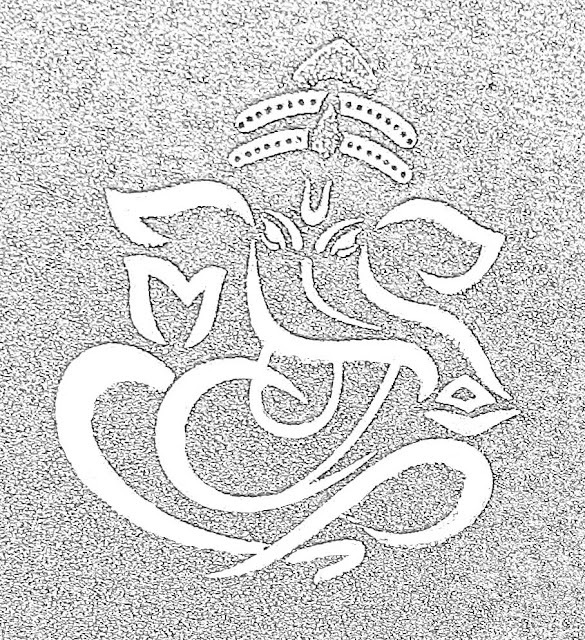 Ganesha's head symbolizes the Atman or the soul, which is the ultimate supreme reality of human existence, and his human body signifies Maya or the earthly existence of human beings. This is a simple sketch of the deity Ganesh. This pencil drawing is black on a white background. A graphic representation of Lord Ganesh. Black metallic outline on a white background. Simple to draw. 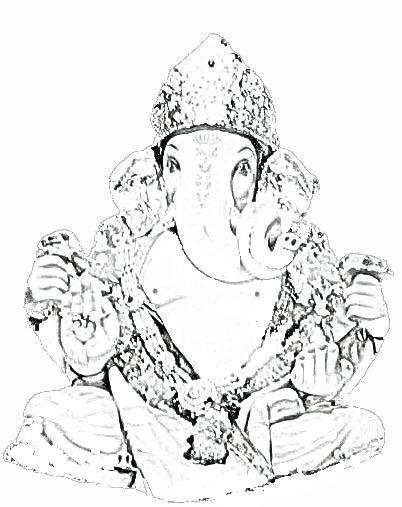 Another graphic depiction or illustration showing the lord Ganpati. Lines and curves drawn on a gray background. 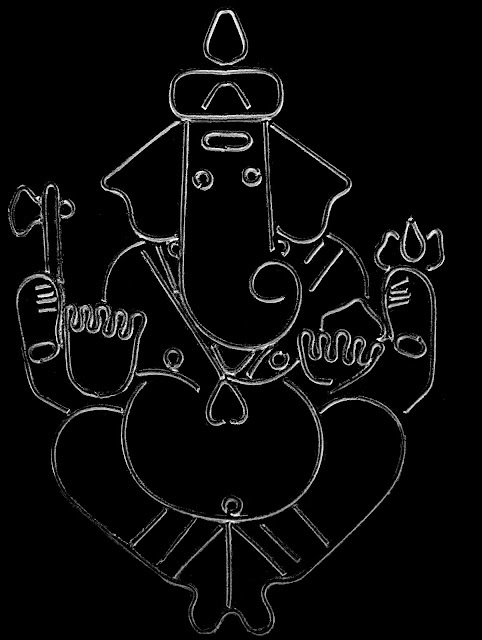 Bold black outlines of Ganesh sketched on dark grey background. This works well as a desktop background. 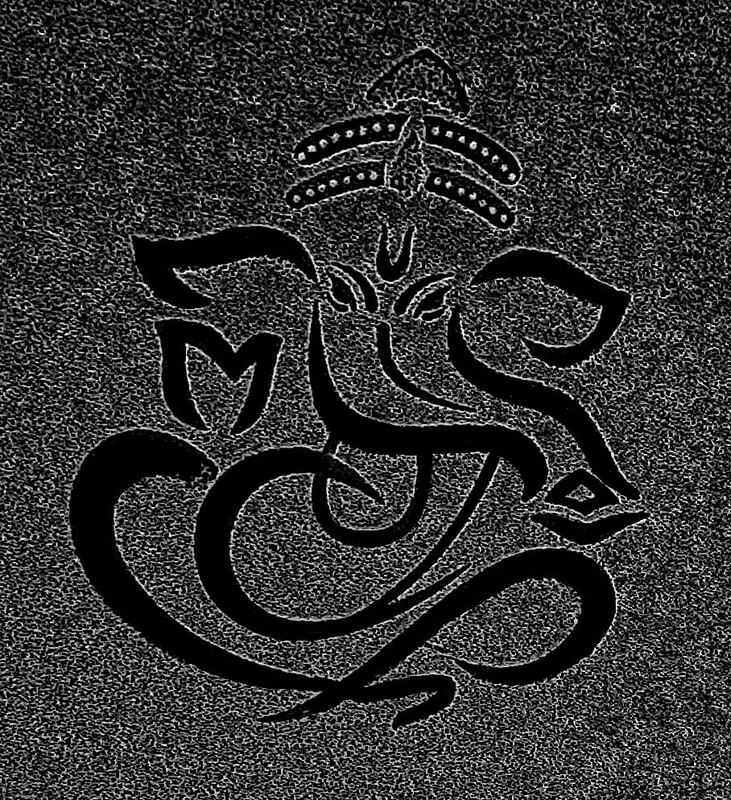 Another image of Ganpati, white metallic lines on a black background. 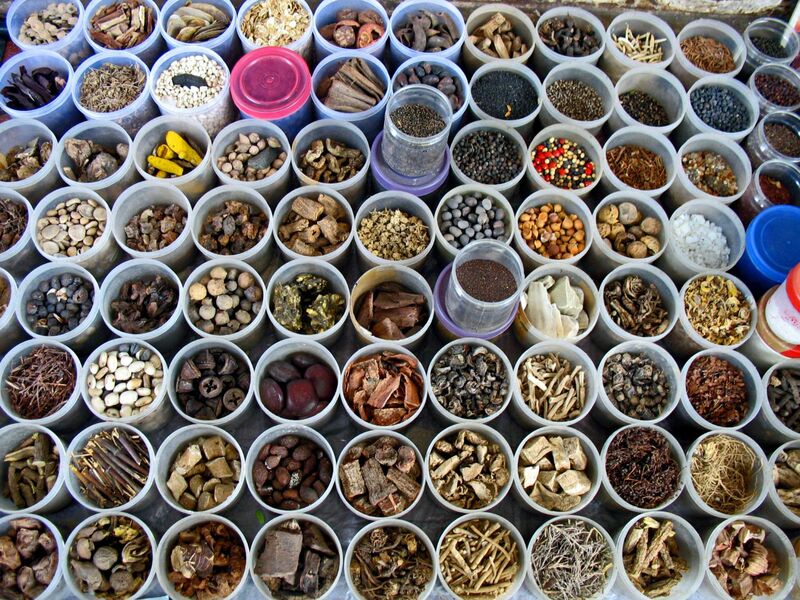 This is a shot of different types of herbs and spices, all neatly laid out in small plastic containers. This wide array of spices and herbs has not been put out for sale by a vendor, but a medicine man who promises to cure all your ailments by using these "medicines!" 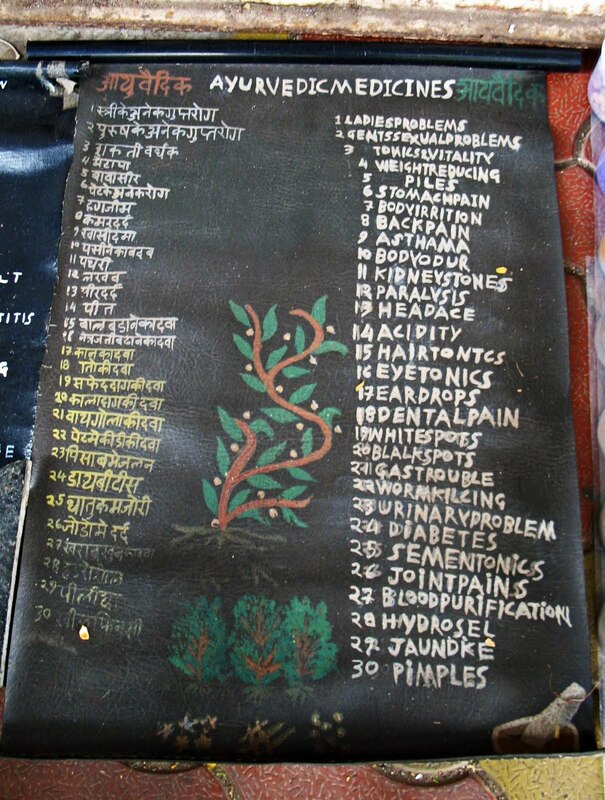 He claims to practice Ayurveda. Here is a a photograph of the medicine man. 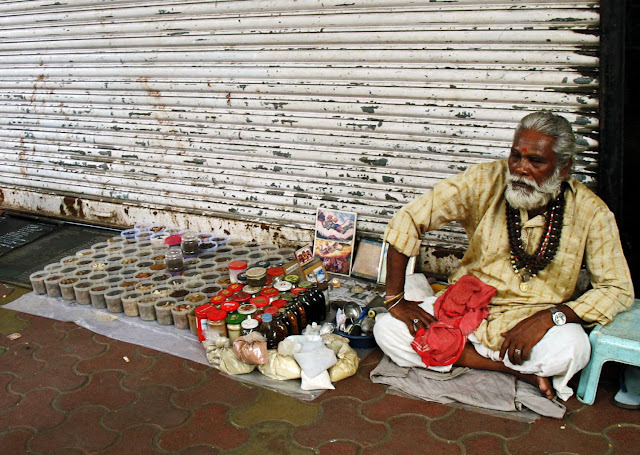 He has a white beard and white hair, wears a silk kurta and beads, all to impress the unsuspecting customer! Wonder what's in those tiny bottles next to the spices. While I do have faith in Ayurveda, this particular "chemist"seems dicey to me! 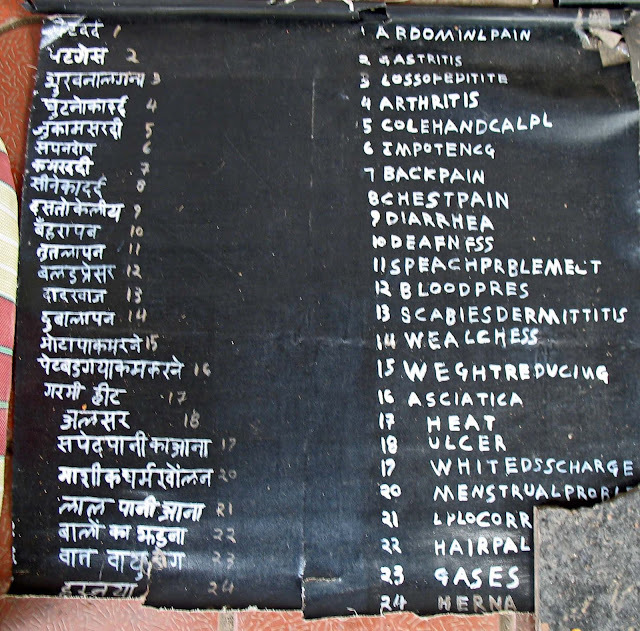 Here is a list of diseases and ailments he hopes to cure. Right from Ladies Problems and Piles to White Spots, Pimples and Dental Pain! As if this is not enough, he claims to help cure Paralysis, Asthma and Jaundice! There's more. Arthritis and Impotence to Hernia and Gastritis! In addition to speech problems and weight gain! Amazing why the authorities allow such people on the roads in Mumbai. This little card was given to us on the London streets of all places! A man claiming to be a gifted african spiritual healer advertising himself! 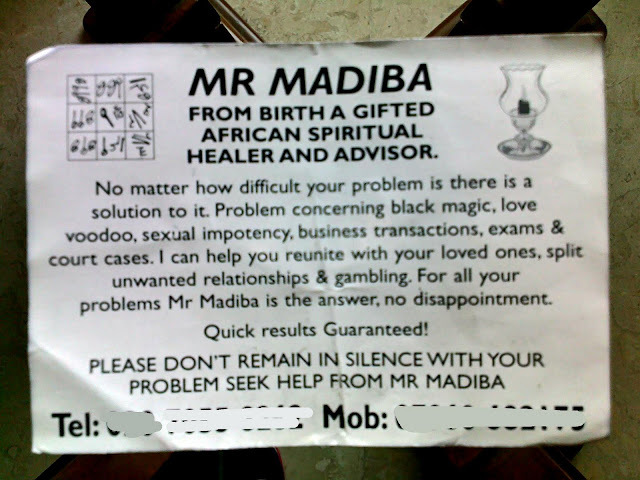 He claims to cure problems concerning black magic and voodoo, exams and court cases! Just how one cannot help but wonder! More pictures: How to make paan in pictures or Chaat or savory snacks in India or check out all the photos filed under the label Food. Dahi Handi is played on Krishna Janmashtami (to celebrate Lord Krishna's birth). It is a popular sport in Mumbai and Thane. Legend has it that Lord Krishna used to steal butter and curd (dahi) when he was a child. 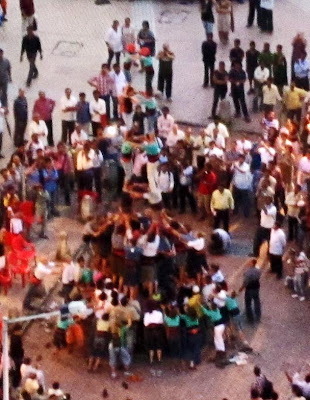 This situation is recreated by the Govindas or Balgopals (players) who make a human pyramid to break an earthen pot (matki or handi) which is tied high in the air at public squares or in the open streets. 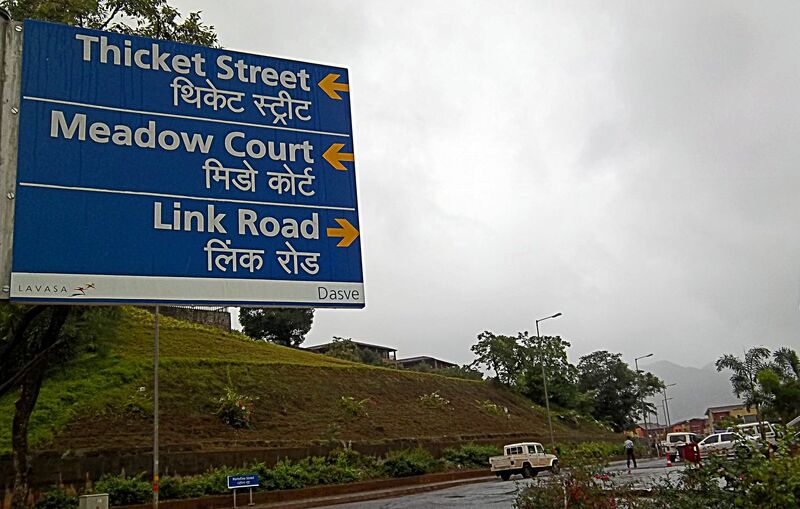 Large sums of money are kept as a reward for breaking the handi, and the prizes go into millions of rupees. 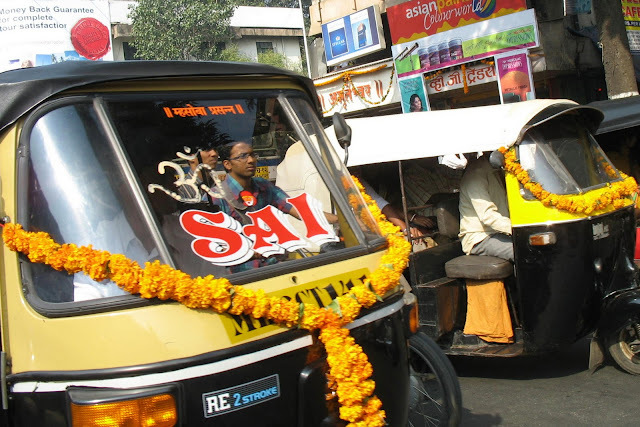 A photograph of Govindas going to a site to compete. 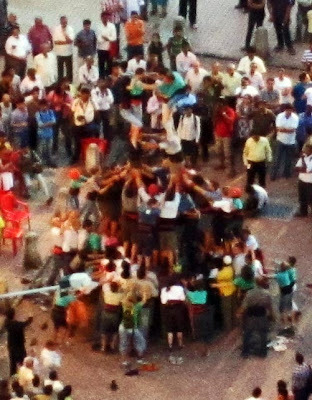 These are images of a Spanish troupe practicing Dahi Handi in Thane this year. They are here to learn and to teach as well. 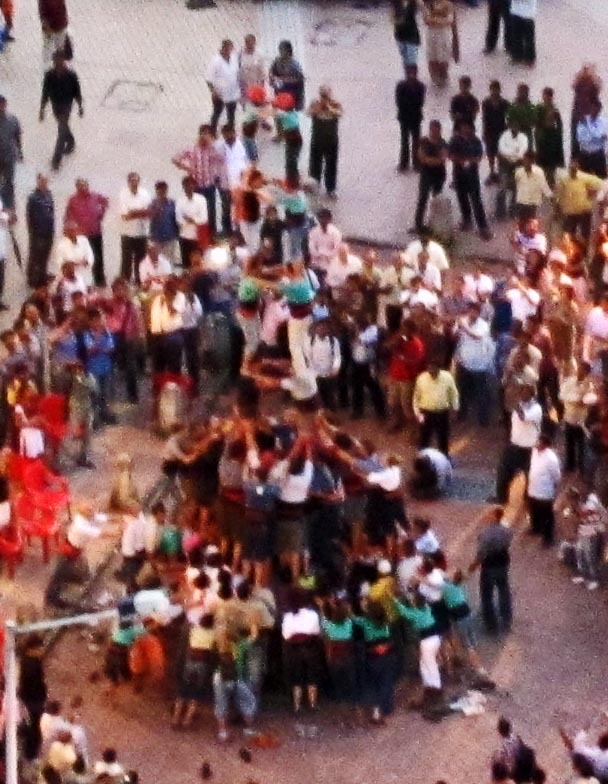 In this first image they have started building the human pyramid. A large crowd has gathered to watch them. 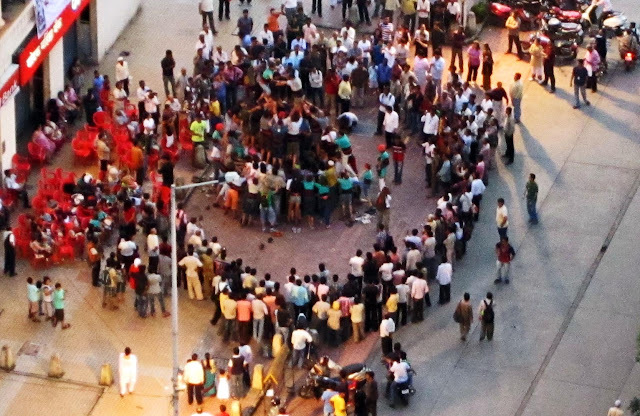 The Spanish group (Castellers de Villafranca) which holds a world record for building a 10-level human pyramid, is poised to take part in the dahi-handi events in Mumbai, Thane and Navi Mumbai this year. The 240-member team is led by Miquel Ferret has been invited by people here. They will compete with the locals for the prize. 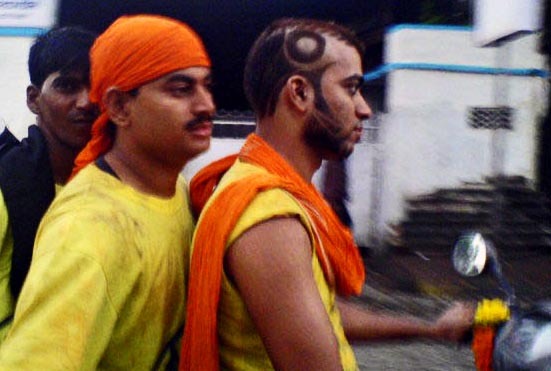 There are plans to promote dahi-handi as a tourism event by the Maharashtra government. 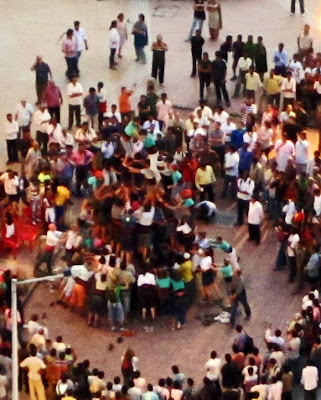 The human pyramid is slowly building up. A five-level pyramid is ready with children as young as five at the top of this human pyramid. Interestingly, they are wearing helmets (in orange) which not many of our locals do. All set to climb down from the pyramid they have built in a matter of minutes. These are photographs of beauty salons. These photographs are of a high-end salon or beauty parlours as they are called in India, although not top of the heap. 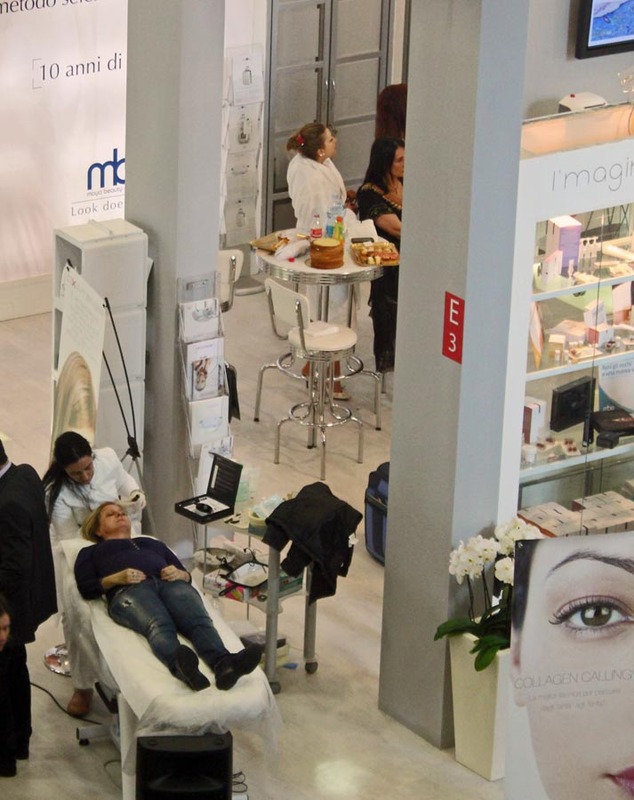 Thousands can be charged for a single treatment. It is fully air-conditioned and caters to women only. 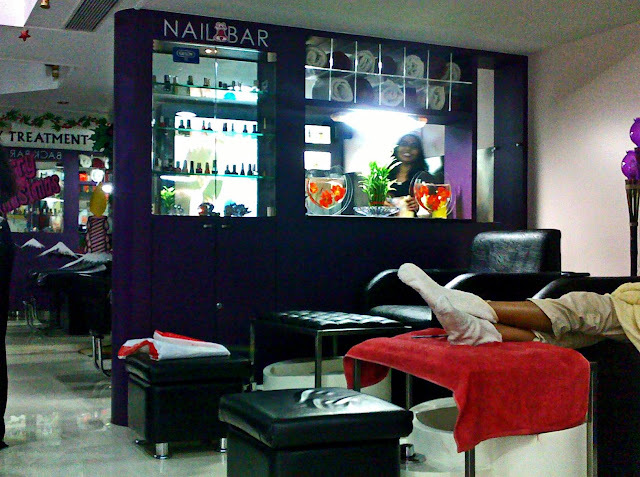 A nail bar shows the various lipsticks which the patrons can choose. A customer can be seen at the right side of the image with her feet up. She has come for a pedicure. A beauty salon in the West. 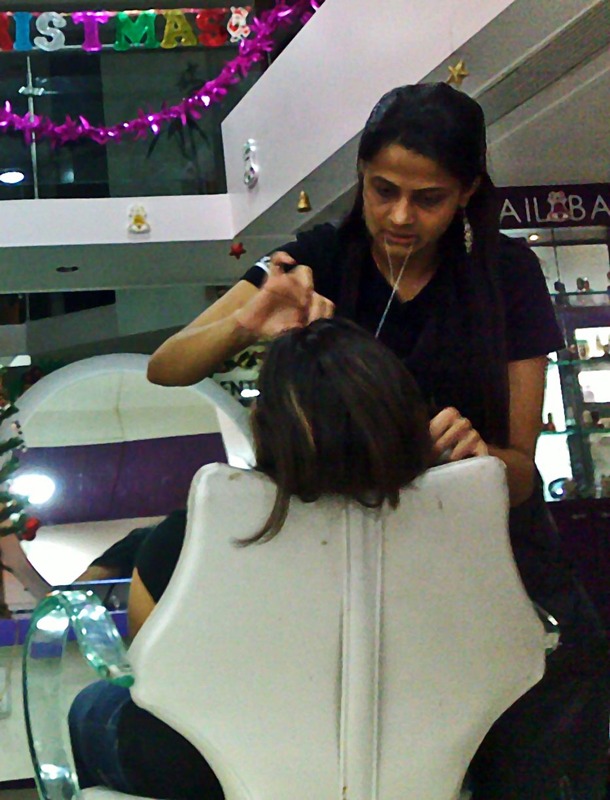 This is a photograph of a girl threading a customer's eyebrows. Threading is a common method of trimming eye-brows and other facial hair and has been so in India for decades. Even today many salons employ this method. It is a technique that several college girls master to avoid paying at a beauty salon. It requires no equipment...just a strong piece of thread which is used as a scissor.